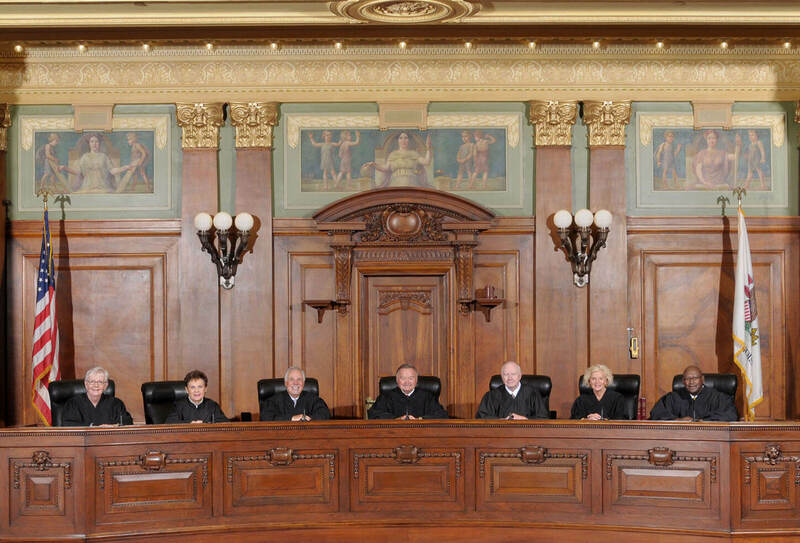 The Illinois Supreme Court seems intent on flouting its indifference to plain wording of the Illinois Constitution, state statutes and its basic responsibilities as our court of last resort. Last month, in a case that got little press coverage, the court was asked to rule on a particular aspect of Illinois’ constitutional balanced budget requirement. The manner in which it dismissed the case was exceptionally irresponsible, imperious and cowardly. The case arose under House Bill 40, which was signed into law in 2017 by former Republican Gov. Bruce Rauner and allows tax dollars to be spent on abortion. But set aside whatever feelings you have on either side of the abortion controversy. This is about the constitutional balanced budget requirement, which is distinct from that. (a) The budget [submitted by the governor]… shall set forth … a plan for expenditures and obligations during the fiscal year of every department, authority, public corporation and quasi-public corporation of the State…. Proposed expenditures shall not exceed funds estimated to be available for the fiscal year as shown in the budget. The supreme court refused to hear an appeal on the claim, which had been dismissed by a lower court. Why? Because the case presented a “political-question,” said the court. That was a cop-out. Unable to defend that cop-out, it submitted no reasoning or opinion whatsoever on its rationale. The issue of what constitutes the parameters of the political-question doctrine is of such vital importance that it should be resolved by the Supreme Court of Illinois and not simply left to the appellate court to grapple with…. Here, the appellate court concluded that the legislature’s compliance with section 2(b) of article VIII of our constitution and section 4(a) of the Act is a political question and therefore not justiciable. That conclusion is undoubtedly of sufficient importance to the people of the state of Illinois as to compel this court’s review. Importantly, the plaintiffs said the state had also violated a state statute that requires a revenue estimate. That, too was dismissed, inexplicably, as a political-question and not for the courts. The majority’s ruling is outrageous and its failure even to file an opinion is inexcusable. Full enforcement of Illinois’s balanced budget requirement has long been regarded as a lost cause in Illinois courts, perhaps with some justification. The provision is vague and no accounting standards are specified, leaving its interpretation to guesswork. Instead, the mandate has long been seen by many as a good faith effort requirement – that the General Assembly should do its best to estimate revenue and costs, and balance them out. But here lawmakers didn’t bother even to make an estimate. There’s no way to read the provision without at least requiring that. Their conduct and the court’s ruling essentially wrote any meaning whatsoever of the balanced budget provision out of the constitution. And what about the statutory violation the plaintiff’s claimed? The state can now ignore its own laws and the state’s supreme court will look the other way? Finally, as the dissenters wrote, the court shirked its responsibility to lay out parameters on the political question-doctrine it hid behind. That doctrine has a long history under federal law. If the Illinois court had taken the case and tried to explain its rationale, as it should have, it would probably have looked to that federal case history for guidance. There are, indeed, disputes so political that courts are right to leave resolution to the legislature. However, the United States Supreme Court recently narrowed the doctrine and laid out some parameters on where it should be applied. In Zitofsky vs. Clinton, the Court reversed a lower court’s dismissal that was based on the political-question doctrine and got quite specific on how the appellate court should apply it. That’s how top courts are supposed to operate. It’s the height of irony that Illinois courts would hide behind the political-question doctrine since they are widely ridiculed as political tribunals and not legal ones. In other rulings, they’ve interpreted the constitution’s pension protection clause as a suicide pact. In a stroke of a pen, they added healthcare benefits to that constitutional protects, the unfunded liability for which now exceeds $70 billion. If you think, as you learned in school, that the Illinois Supreme Court acts as a third branch of government providing a check and balance, you are naïve. *Mark Glennon is founder of Wirepoints. UPDATE 4/4/19: The Illinois Supreme Court ruled today that an Illinois union lobbyist can keep public pension windfall he got for one day of substitute teaching. “… flouting its indifference to plain wording of the Illinois Constitution …” The court may be *flouting* the plain wording, but it’s *flaunting* its indifference to it. They should have defined the expenditure and how the source of the funds to pay are or would be gotten before passing HB40 and before the governor signed the bill. However, I believe the bill was passed to save the State money. Just a little informed suggestion here: Ask Ms. Rauner her rationale for telling her husband to sign the bill. Amen! Mr. Caplan, after you win your battle to move the Obama Center to a different location. we’re putting you in charge of the Alliance to Enforce the Guaranty Clause. MichaelMadigan.com has polluted the court. You cannot get a fair shake in the Illinois court system unless you are a crony and pay the right people who will pull the right strings. It is dangerous, and given the recent “show me the man and I will show you the crime” attitude of the Establishment/Machine Democrats corrosive to society. Just another reason to leave if you are a business or individual. Or leaving. You fight the battles you can win. Ok, is it time to split this banana republic.? Reform opponents say it's a waste of time to pursue a constitutional amendment. They're wrong. Sign me up for the WirePoints newsletter. If you look at Chicago’s collapsing demographics and consider how they’re threatening the solvency of the city’s government-run pensions, you can’t help but call it a Ponzi scheme. Some New Trier Township residents were stunned to see the assessed value of their homes jump by as much as 40, 60 or even 100 percent this year. Also see our related article linked here on the "town hall" meeting discussed herein. Note, especially, the comparison to neighboring states for the last five years. A reader who asked to stay anonymous sent this image in of a shirt he had made. The joke backfired. © WirePoints, Inc. 2012 - 2019. All rights reserved.